Since time immemorial, the most evil of souls have sought after a legendary weapon rumored to grant its welder the power lay waste to their enemies, crush empires, and rule in absolute power. The Rune Breaker. The truth behind the legend is far stranger: the Rune Breaker is really Ru Brakar, an ancient wizard bound to serve whosoever controls the spell that binds him—and that spell just fell into the hands of the ang’hailene woman, Taylin. From the deepest, most dangerous mines to the front lines of airborne combat, Taylin has spent her entire life as a slave, hating her masters more and more every moment. She wants no part of keeping a slave of her own, no matter how powerful. The choice is soon taken out of her hands, as the pair find themselves stranded in an alien future. There, they will need to rely on one another and a host of new allies; not only to navigate their new world, but to fend off the machinations of Immurai the Masked, a demon with a history with Ru and whose plans for them pose a threat to the very gods. 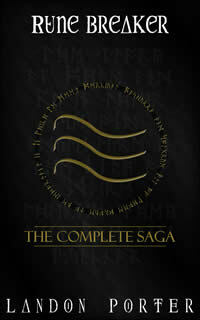 Rune Breaker:The Complete Saga collects the entire webserial novel series, Rune Breaker by Landon Porter, reprinting the following books: A Girl and Her Monster, Lighter Days, Darker Nights, The Path of Destruction, and Evil Unto Evil. It also reprints bonus material from Evil Unto Evil and includes a pronunciation guide.